I am currently researching my mother's side of the family in Poland. My grandmother's maiden name was Marya Janusz and her parents were John Janusz and Franciszka Wieszczek. I found her immigration records today and it said she was born in Lutcza, Galicy. She emigrated to the USA when she was only fourteen years old. My grandfather was Jacob Pitera and his parents were John Pitera and Zofiz Kryska. 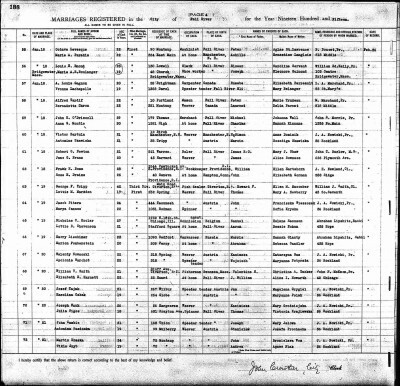 I found his birth date and birthplace on his WWI draft registration...November 28, 1891 in Lutcza, Strzyzow. I have not found any records for his emigration to the United States yet but records say he also came in 1907. It appears that my grandparents were originally from Lutcza. If you have any knowledge about their families or relatives, I would love to hear from you. My husband and I visited Poland for the first time in Sept. We took a tour with some of my relatives and we were so impressed! We are eagerly looking forward to returning but this time I want to trace my roots and visit the villages my ancestors came from. Does anyone recognize any of these names or can you shed any light on my search to find information about their lives in Poland? I do have their marriage certificate from Fall River, Massachusetts. USA (which is how I got their parents' names) and information from their census. My mother is 89 and the last of the Pitera children still living. She can tell me a lot about their lives here in the states, but knows nothing about anything that took place in Poland. I am so proud of my Polish heritage and eagerly look forward to learning more about it! Thank you! Gilberto sent me some very valuable information too! This is so fascinating! I'm truly hooked now on finding out everything I can about my Polish ancestry. The sooner I do, the sooner we will be returning with my daughters to travel to all these places. I can't wait. Hi. I'm french. I visited Lutcza twice because my grand-father was born at Lutcza. Do you know when your grand-mother Marya Janusz was born? Best regards. You and I are working separate branches of the same Sieczkowski-Pitera-Janusz family tree. 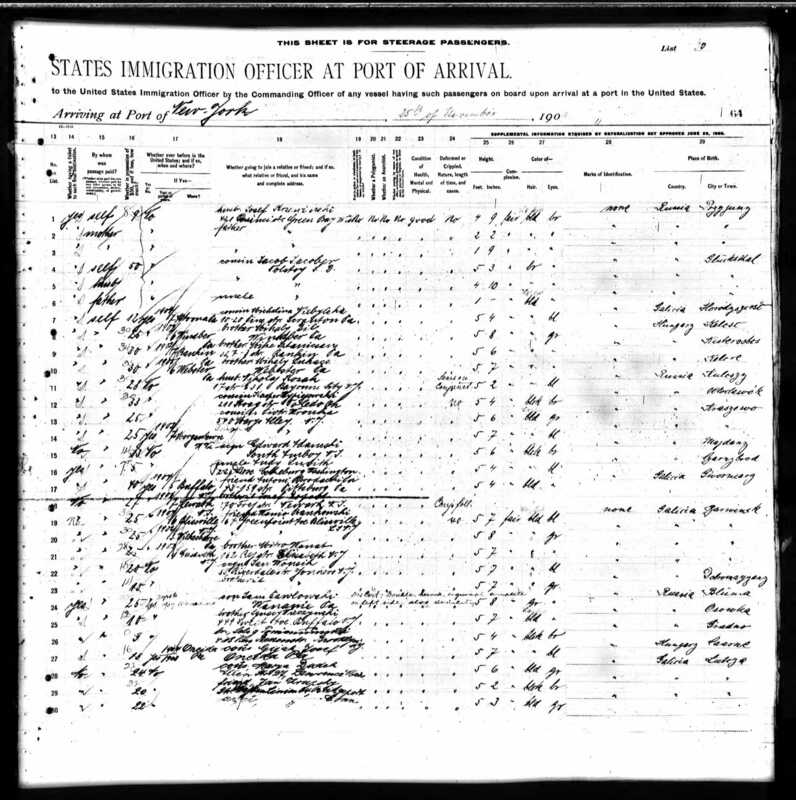 I believe I have located Jacob Pitera's immigration records from 25 November 1909. 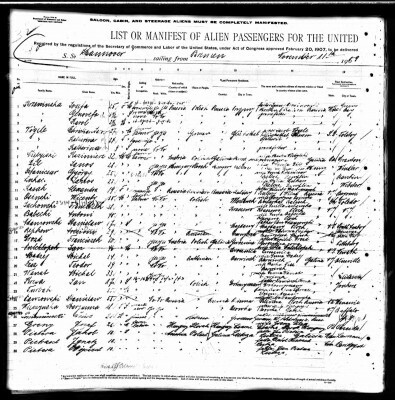 He is listed as Jakob Pietera - a common misspelling of Pitera - on the New York Passenger Lists. His father is shown as Jan Pietera from Lutcza, Galicia. 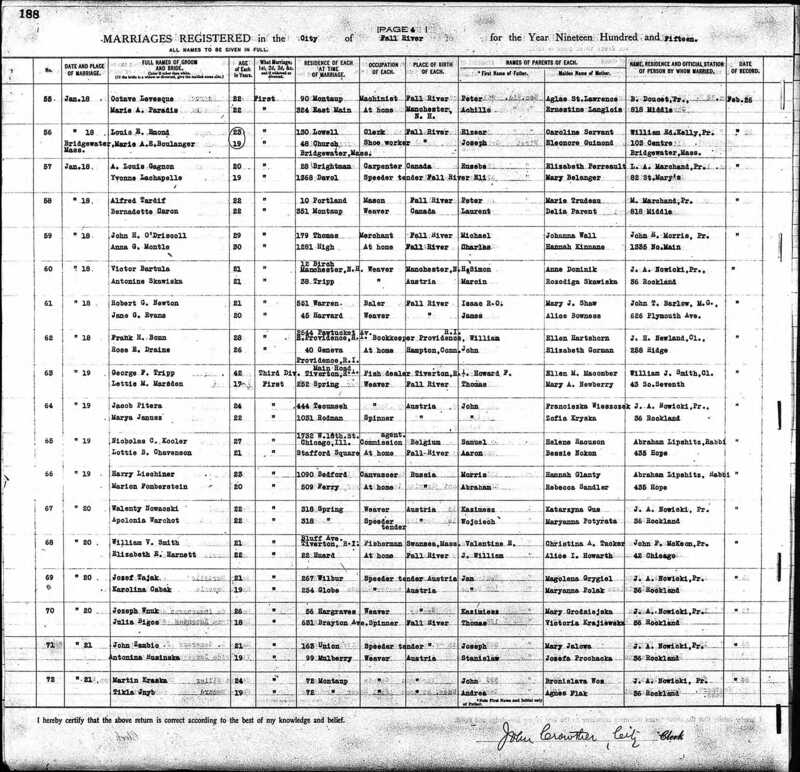 The names are good, immigration dates are close to what his census records show, and the point-of-origin is perfect, which is better than most for these Polish genealogy hunts. He's on line 28. It's important to look at both pages of the manifest. 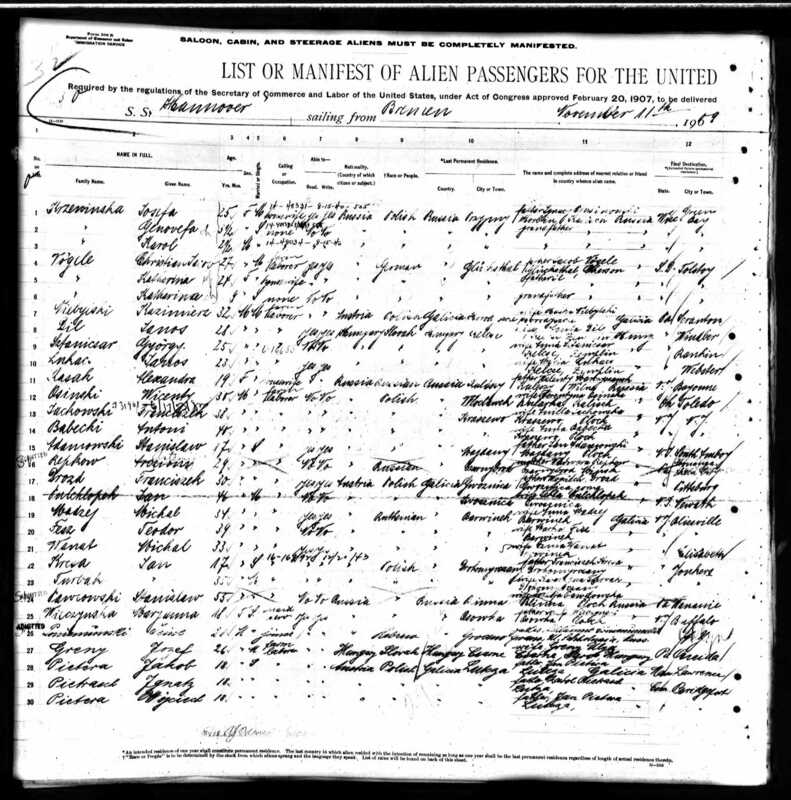 Importantly, he traveled with at least three other Polish men from Lutcza, including a probable brother Wojciech Pietera - whose father is also shown as Jan Pitera, though his destination was Bridgeport CT.
Jacob's personal reference was his cousin "Marya Dudek" (later Maria/Mary Sieczkowski) of Allen Street, Lawrence, Massachusetts - my maternal GGM. My research of city directories from Lawrence also showed that in 1912 a Jacob Pitera lived briefly at 101 Union Street in Lawrence with Andrzej Pitera (Mary's probable brother), Stanislaw Pitera, and Jozef Pitera, but then disappeared from Lawrence. During that timeframe, a number of different Pitera's arrived in then departed Lawrence; these include Jakob (as discussed here), a Jozef, a Stanislaw, a Karol (wife: Helena), and a Walter (wife: Balvina). I haven't really pulled the thread on some of these, yet, but will.